Did you process backup withholding for a non-employee last year? Here is the procedure for (a) paying and (b) reporting that withholding to the IRS on Form 945. Payments to non-employees must be reported to the IRS, but normally no withholding of income tax is required for these payments. But in some instances, backup withholding is required. If you must take backup withholding from non-employees, you will need to report the payments and the withholding. IRS Form 945 is used to report on federal income taxes withheld from non-employees, specifically backup withholding. First, I'll give you the background to explain when Form 945 is necessary, then I'll show you how to complete this form, and how, when, and where and when to send it. UPDATE: Effective for the 2018 tax year, the backup withholding rate has been reduced from 28 percent to 24 percent. The IRS requires that you withhold income taxes from employee earnings, but there are also some other types of payments your business might make that require you to withhold income taxes and report and pay those taxes to the IRS. The IRS calls these "non-payroll income tax withholding." First, an explanation of federal income taxes for non-employees. These individuals are paid by your company for services they perform as independent contractors. Because they are not employees, you are not required to withhold federal income taxes from amounts you pay them. But you must provide these individuals with a 1099-MISC form in January, after the year in which they worked for you. (The 1099-MISC is like a W-2 for employees.) In order to prepare the 1099-MISC, you must get the person's federal tax ID number. To get this number, you must have the person complete a W-9 form showing the tax ID number. But what if someone's tax ID number is missing or incorrect? Then, the IRS says you must withhold taxes from the payments you make to this person during the year using a process called backup withholding. The withholding rate is currently 24%. You don't need to start backup withholding until you are notified by the IRS. You had a new freelance web designer working for you last year as an independent contractor, continuing into this year. When she started, you requested a W-9 form, but you never received it. INow the IRS has sent you a notice that backup withholding payments must be made. 1: Notify the worker that you will be withholding income taxes from payments. 2: Process payments for that worker to include backup withholding at the current rate, 24 percent. 3. Include the withholding information on the person's payment stub. 4: Deposit the backup withholding amounts (see below). You don't need to withhold Social Security or Medicare taxes from these payments. 5. Make periodic payments of the amount withheld to the IRS. 6. Give the person with a 1099-MISC Form in January of the following year. The 1099-MISC will include the total backup withholding for the year. 7. Report the total backup withholding for all non-employees on Form 945 by January 31 of the following year. Form 945 is an annual return, showing all the federal income taxes you withheld under backup withholding requirements from all non-employees/freelancers. All federal income tax withheld from all individuals subject to backup withholding. Total backup withholding calculated at total pay for all individuals times 28%. (This is the backup withholding rate, the amount you are required to pay the IRS). Total deposits made during the year. 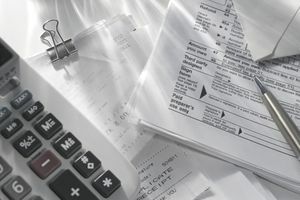 If you pay more than $2500 in backup withholding during the year, you will need to break down that total to show monthly tax liability (that is, the total amounts paid times 28%). Form 945 is filed with the IRS at the same time as you file W-2 forms and 1099-MISC forms - by January 31 of the following year. See this article for the specific reporting dates for the current tax year. Backup withholding payments are made in the same timing as withholding for employees, using the rules for determining whether to make deposits semi-weekly or monthly. If you are sending Form 945 by mail, where you send it depends on whether or not you are making a payment. See the chart in the Instructions for Form 945 to select the correct address. You can file Form 945 with the IRS using the e-file system. You may make backup withholding payments to the IRS electronically using the EFTPS system. The IRS also has other options for paying these taxes; see this article on Payments. If you are using tax preparation software or the services of a tax preparer, you can file Form 945 and make deposits of backup withholding together. See the Instructions for Form 945 for more information.